"What is the Greatest Commandment and WHY | And The Second Greatest Commandment?" and Savior. The Creator of the Heaven and the Earth, the Sea and all that is in them. 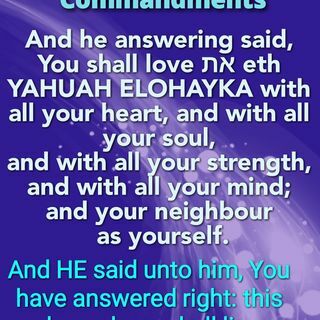 Luke 10:27 And he answering said, "Thou shalt love YAHUAH your ELOHIYM with all thy heart, and with all thy soul, and with all thy ... Más informaciones strength, and with all thy mind; and thy neighbour as thyself." As I'm typing I'm smiling as I know we are in for a great Lesson this morning through the Power of the RUACH HA'QODESH of ABBA YAHUAH given to HIS SON...KING YAHUSHA HA'MASCHIACH for having laid down HIS life for us so that we may have the Free Gift of Eternal Life offered to everyone. Acts 2:37-39 Answers how does one be saved? Now when they heard this, they were pricked in their heart, and said unto Peter and to the rest of the apostles, "Men and brethren, what shall we do?" Then Peter said unto them, "Repent, and be baptized every one of you in the name of YAHUAH YAHUSHA for the remission of sins, and ye shall receive the gift of the RUACH HA'QODESH/HOLY SPIRIT." "For the promise is unto you, and to your children, and to all that are afar off, even as many as YAHUAH ELOHIYM shall call." Beloved, it is my sincere Prayer that you will come to the knowledge of the Truth that YAHUSHA HA'MASCHIACH is the only WAY, the TRUTH and the LIFE unto ABBA YAHUAH.